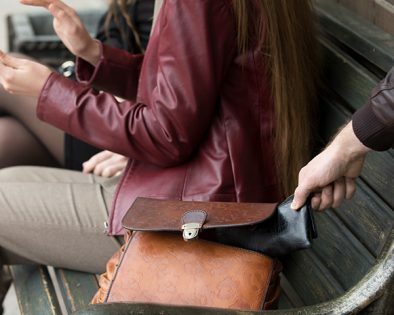 Robberies are driven by opportunity, the vulnerable you appear, and the more likely you will be robbed. Last year the Edmonton Police Service received more than 1,500 service call to report a personal robbery. Robbery offenders are often addicted or dependant on drugs. They commit these crimes to get money to buy drugs. Drug abuses can be very unpredictable and violent. If you are approached by someone who produces a weapon by all means, give them what they want. You life is more precious than money. There are several things that can be done to protect you and lessen the opportunity of becoming a victim. Park in well lit area, use an anti-theft steering wheel locking device (club) and lock all doors. Check the car’s interior and have your keys ready to unlock the car door when you return. Don’t put yourself at risk. Use caution when using elevators, isolated stairways and washrooms. Remain alert; wearing earphones may decrease your awareness. If you are approached, keep a comfortable distance between you and the stranger while answering questions or giving directions. Never turn your back on anyone who has approached you. If you have been robbed contact the Edmonton Police Service at 780-423-4567 to report the incident.